Posted on Thu, Feb 9, 2012 : 12:20 a.m.
LINCOLN, Neb. -- Zack Novak isn't one to brag. So, it came as no surprise Wednesday when the Michigan basketball captain shrugged off his induction into the 1,000-point club with a bit of self deprecation. In Novak's words, it took him long enough. "If I did it in a timely fashion, it'd be cool," Novak quipped following Michigan's 62-46 win at Nebraska. "But I just feel like, at this point, I've been playing like 35 minutes a game for four years. "I don't think that averages out very well." With his 14-point performance in a win at Nebraska on Wednesday, Michigan senior co-captain Zack Novak became the 28th player in school history to record at least 1,000 points and grab 500 career rebounds. With a 3-pointer in the first half, Novak officially became the 45th member of Michigan's 1,000-point club. The senior guard finished with 14 points on the day, and now has 1,008 career points. He also became the 28th player in school history to record at least 1,000 points and grab 500 career rebounds. However, of Michigan's entire collection of 1,000-point scorers, Novak has the lowest career scoring average at 8.1 points per game. The next closet is Thad Garner (1,039 points), who averaged 9.4 points per game from 1978-82. "It's probably been the steadiest 1,000 points ever," Michigan coach John Beilein said with a smile. "If you look at him, he probably averages seven or eight points a game for four consecutive years (and scores 1,000 points), who does that? "But he's a great defender and he's just wonderful to coach. If he's at 1,000 points, then he's also got one million points in leadership." Novak said he wasn't aware before the game that he was nearing 1,000 points, and didn't seem too concerned with the feat afterward. To his teammates, though, the statistic means plenty. "For a guy like that, who has done nothing but work hard since he got here, it means a lot," Michigan sophomore Jordan Morgan said. "It matters to us. You want to see your captain succeed. "And he's done nothing but work hard and set an example for us since he's been here." 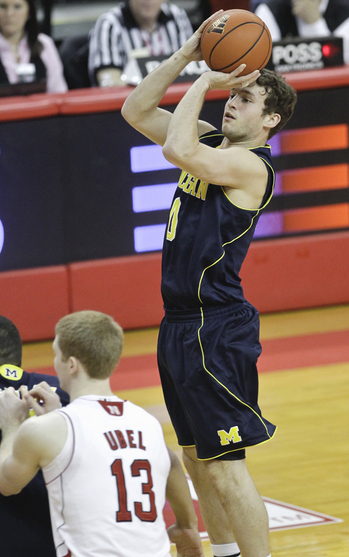 Michigan senior Stu Douglass is the next-closest Wolverine to 1,000 points, sitting at 874. Sophomore Tim Hardaway Jr. is next with 843. On Wednesday, though, the Wolverines were happy enough celebrating Novak's milestone. Even if he wanted no part of it. "He's a very interesting young man," Beilein said, grinning. "And he really has his priorities in the right order." Michigan reserve guard Matt Vogrich needed less than two minutes to break his way out of a shooting slump Wednesday. The 6-foot-4 junior nailed three 3-pointers in the span of 112 seconds during the second half against Nebraska, marking the first time in his Michigan career that he's hit three triples in a Big Ten game. Entering the contest, Vogrich has been shooting 21.2 percent from 3-point range. "That was huge," Douglass said. "The bench doesn't get a bunch of minutes combined, so they've just got to play with confidence." 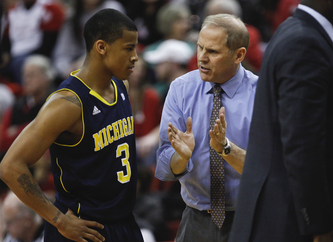 Michigan coach John Beilein instructs freshman point guard Trey Burke during a game at Nebraska. Wednesday marked Beilein's first time ever setting foot inside the state of Nebraska and the first time he'd ever coached against Cornhusker coach Doc Sadler. Afterward, he spoke about the oddities of prepping for a first-ever Big Ten game against the Huskers. "It was different," Beilein said. "Coming all the way out here, I had our guys drinking water like we were flying out to California, just to make sure (there was no cramping) with a long flight out there. "But I've got so much respect for Doc, the way he carries himself and the way his team plays. I'm glad we didn't fall the way Indiana, Penn State and Iowa did (at Nebraska) this year." Michigan earned its first Big Ten victory over Nebraska on Wednesday and its first ever win against the Cornhuskers in Lincoln, Neb. Nebraska scored a 74-73 win over then No. 1 Michigan in 1964 and a 73-60 win over the Wolverines in 1956. With the win Wednesday, Michigan now leads the all-time series 7-2. The 16-point win was Michigan's second road victory of the season, but it was also the largest Big Ten margin of victory the club has scored on the road in Beilein's five seasons as head coach. The most lopsided road win under Beilein entering the Nebraska game was a 10-point win at Northwestern in 2008, Beilein's first season as coach. According to the Big Ten Network, Michigan's 7-0 record after a loss is the best mark of any team in the country. ... Michigan yielded a season-low 15 first-half points Wednesday. ... The Wolverines were out-rebounded 29-22. ... Michigan forced 14 turnovers and tallied 14 points off those miscues. Thu, Feb 9, 2012 : 8:20 p.m.
if Michigan had 4 or 5 Novaks on the roster, they would be a championship contender every year. the young man is a so tough, plays so hard and is a great leader. Go Blue! Thu, Feb 9, 2012 : 6:17 p.m.
Thu, Feb 9, 2012 : 4:06 p.m.
Congrats to Novak. Consistency over flashiness. Thu, Feb 9, 2012 : 12:56 p.m.
Thu, Feb 9, 2012 : 12:08 p.m.